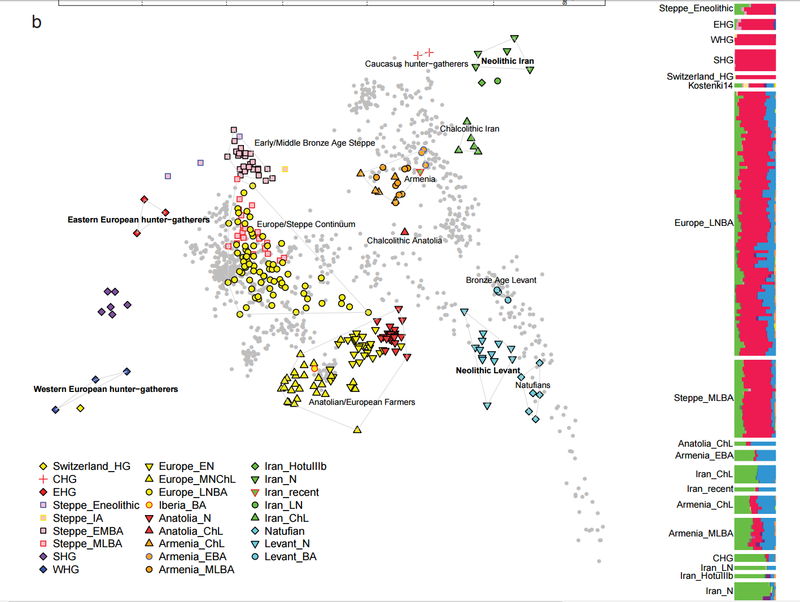 Yeah, ~10% of indirect Anatolian admix in Yamnaya = PIE homeland in Anatolia FTW!!! Seems a desperate attempt to keep their untenable beliefs alive. I think I know their underlying ulterior motives, but I will refrain from politics. I wish they would. But anyone with common sense can see through it. Unfortunately, the general public will not. Which is corrosive. Kulturkugel?? They entered as a culture bullet (blitzkrieg) and all we see is the tracer dye dna! That is by far not the most ridiculous article about Indo-Europeans i have read. For example this article in a major german news site argues that Indo-Europeans spoke "genderized semitic" https://www.welt.de/kultur/literaris...Semitisch.html Even if you are not well read in this topic you should not write such kind of articles.... But many journalists either have an agenda or know nothing about the topic they write about. Oh they were very strong women (according to Maria Gimbutas). Last edited by Ral; 02-10-2019 at 08:59 AM. Something I should mention about the report on the Roman genomes. I just remembered that I didn't ask if the aDNA was PCA'ed together with the moderns, or projected on the moderns. If projected, this would cause shifts away from the real positions on PCA space (projection bias), shrinking all samples toward the center of the plot. The centre was close to S Italians and the E Med continuum. This may or may be an issue with the interpretation of the positions of the points. Last edited by Ryukendo; 02-10-2019 at 10:44 AM. Stupid question: Any memory of if it looked more like the kind of PCA we normally see in papers (1 / 2) where the "Euro-HG" cline is very close to present day North Europe and Sardinia overlaps EEF (or is further "west" than them)? If you only were given a zoomed in closeup though, I guess you won't be able to tell. If it was like that, then there's probably some degree of projection bias, though this tends not to affect position projected ancients relative to each other (though it can, if they're outside the scope of variation on the plot, but unlikely for ancient post-Neolithic Italians), more our idea of modern-ancient overlap. 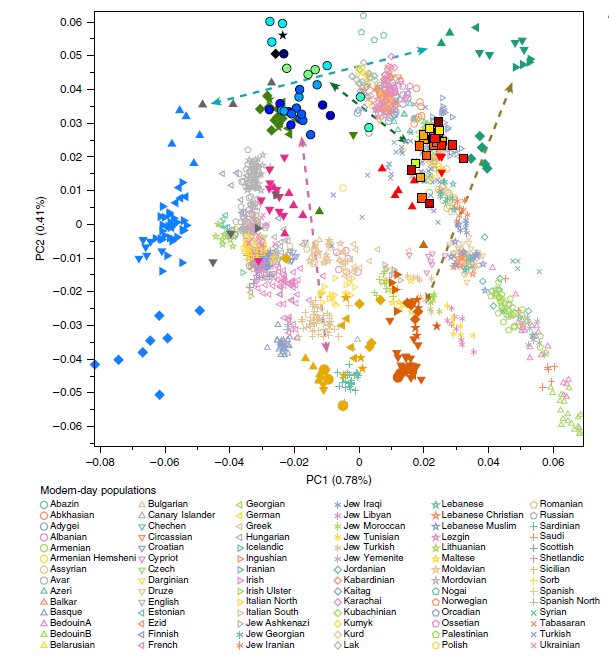 "Yamnaya deviate from the EHG-CHG admixture cline towards European populations in the West. We show that these individuals had received AF ancestry, in line with published evidence from Yamnaya individuals from Ukraine (Ozera) and Bulgaria. In the North Caucasus, this genetic contribution could have occurred through immediate contact with Caucasus groups or further south. An alternative source, explaining the increase in WHG-related ancestry, would be contact with contemporaneous Chalcolithic/EBA farming groups at the western periphery of the Yamnaya distribution area, such as Globular Amphora and Cucuteni–Trypillia from Ukraine, which have been shown to carry AF ancestry. Archaeological arguments are consonant with both scenarios. Contact between early Yamnaya and late Maykop groups is suggested by Maykop impulses seen in early Yamnaya complexes. A western sphere of interaction is evident from striking resemblances of imagery inside burial chambers of Central Europe and the Caucasus (Supplementary Fig. 8), and similarities in geometric decoration patterns in stone cist graves in the Northern Pontic steppe, on stone stelae in the Caucasus, and on pottery of the Eastern Globular Amphora Culture, which links the eastern fringe of the Carpathians and the Baltic Sea. This overlap of symbols implies a late 4th millennium BCE communication and interaction network that operated across the Black Sea area involving the Caucasus and later also early Globular Amphora groups in the Carpathians and east/central Europe. The role of early Yamnaya groups within this network is still unclear. However, this interaction zone predates any direct influence of Yamnaya groups in Europe or the succeeding formation of the Corded Ware and its persistence opens the possibility of subtle gene-flow from farmers at the eastern border of arable lands into the steppe, several centuries before the massive range expansions of pastoralist groups that reached Central Europe in the mid-3rd millennium BCE." Gordon Childes theory on the PIE languages - from 1926 - may, after all, still be closer to reality than Anthonys Steppe-hypothesis. Last edited by Boreas; 02-11-2019 at 10:02 PM.